Sen. Kamala Harris (D., Calif.) sent an email Thursday encouraging people to donate money for disaster relief caused by the wildfires raging across California, but she did not disclose the included links directed users to the website of Democratic group ActBlue. ActBlue, a federally registered political action committee, helps Democratic candidates raise money and saves donor emails for future fundraising efforts. The Northern California wildfire started last week and has erupted into chaos; at least 63 people have died as a result, and over 630 people are currently missing, according to Politico. 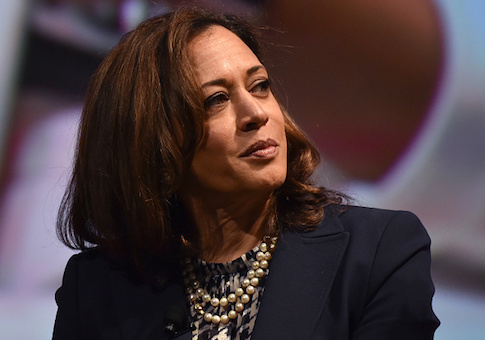 Harris, who has been floated as a potential 2020 presidential candidate, sent out an email with a list of nonprofit organizations, which she said are "doing incredible work to help all those displaced and hurt by the California wildfires." The nonprofits include Wildfire Relief Fund, Humane Society of Ventura County, United Way of Northern California, Northern California Fire Relief Fund, Caring Choices, and California Fire Foundation, among others. After the list of nonprofits, the email lists the donation amounts, ranging from $10 to $250. Each link sends users to a page on ActBlue's website asking people to donate to efforts to help those displaced by the fires. ActBlue, launched in 2004, has called itself "the online clearinghouse for Democratic action." "A majority of Democratic Senate and House campaigns—along with the DCCC, DSCC, DGA, over one-third of statewide campaigns, and advocacy organizations around the country—have chosen ActBlue," the website adds, noting that the organization has raised nearly $3 billion for "Democrats and progressive causes" in 14 years. This isn't the first time a Democratic senator has sent out a fundraising email for a natural disaster without disclosing the ActBlue association. Sen. Bill Nelson (D., Fla.) sent out an email last month encouraging people to donate money for hurricane disaster relief with a list of nonprofit groups that provide aid. The included links also directed potential donors to ActBlue's site.